Femoral percutaneous access can give rise to complications. 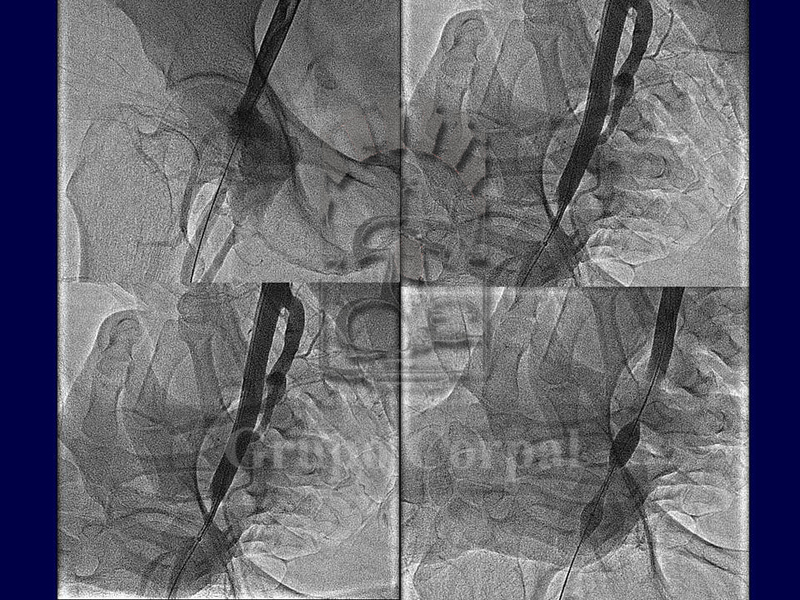 Although such complications have been reduced with closure systems, catheter diameters have increased for special procedures such as percutaneous prostheses, Mitraclips, etc. 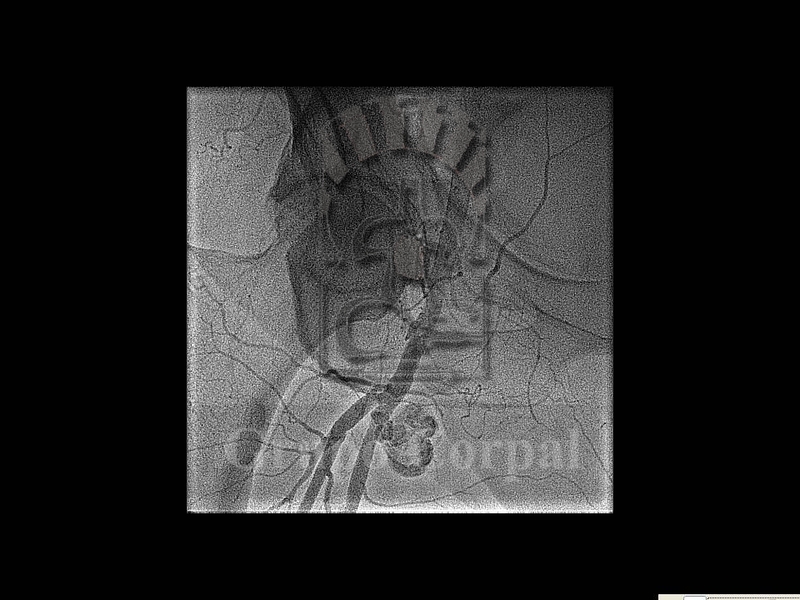 The onset of a diffuse haematoma that extends and disappears over time is normal. 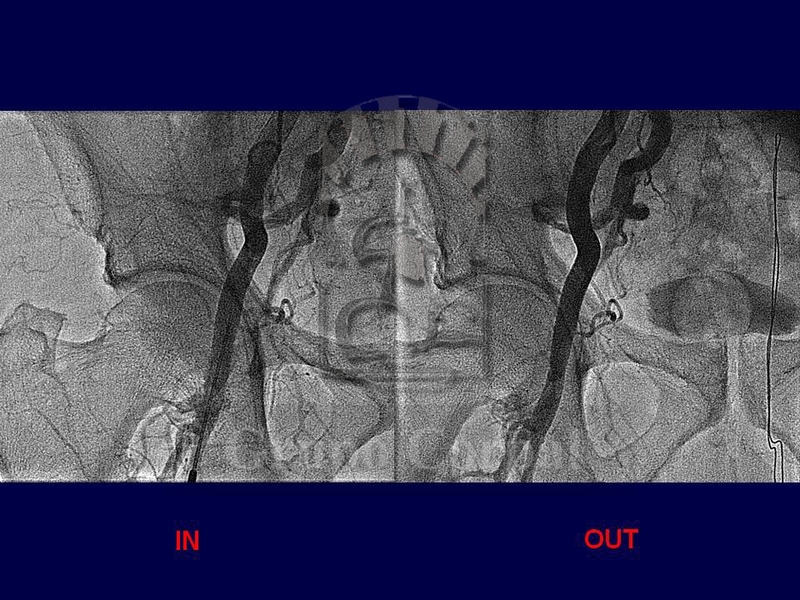 However, there are complications that previously required surgery and long hospitalisation, due to the characteristics of the puncture, surrounded by a large haematoma. 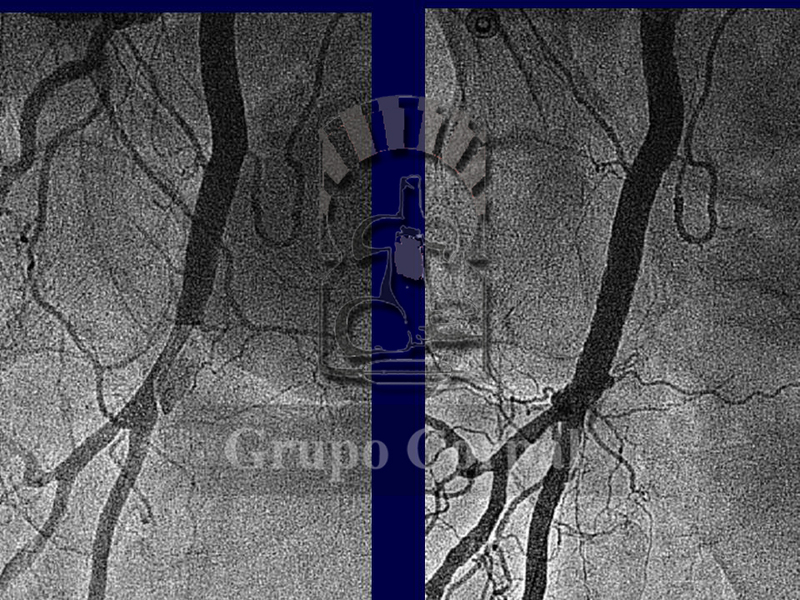 Over time, we have learned how to manage such complications percutaneously, a simple and effective method. 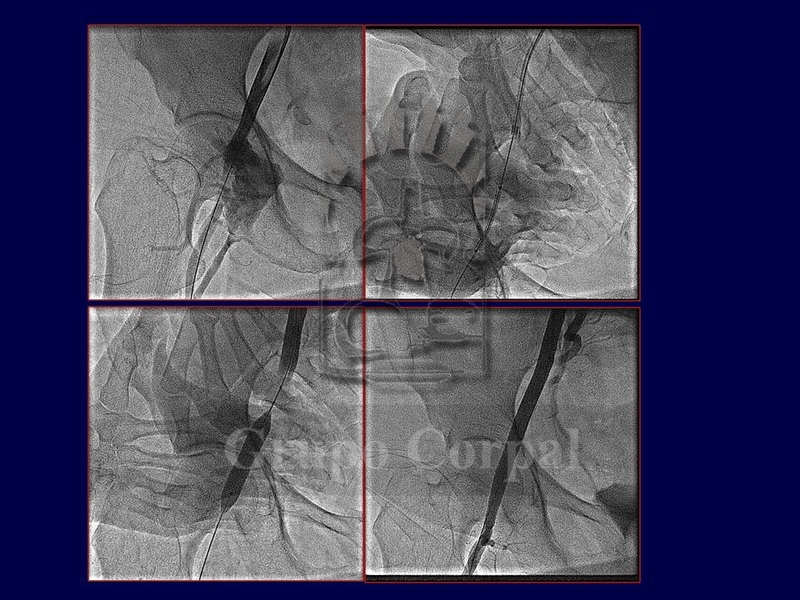 The most common complication is pseudo-aneurysm on the arterial puncture site. With each heartbeat, a micro-spray at that point dilates a sac-like structure in the surrounding tissue. This can grow and cause pain, occasionally intense, and swelling of the leg. A physical examination reveals a continuous murmur in the area of the pseudo-aneurysm. 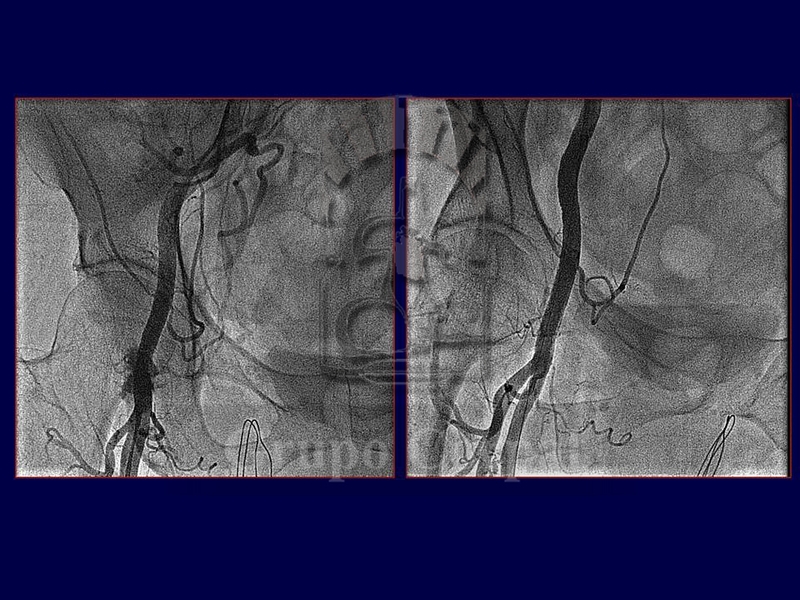 It can be studied by ultrasound or CT scan to precisely determine the bleeding point. 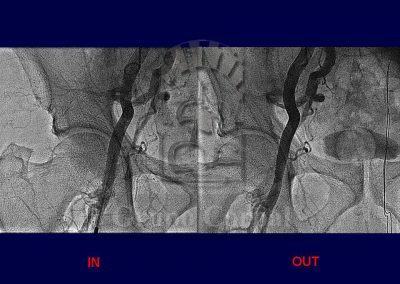 There are different options for closing pseudo-aneurysms. 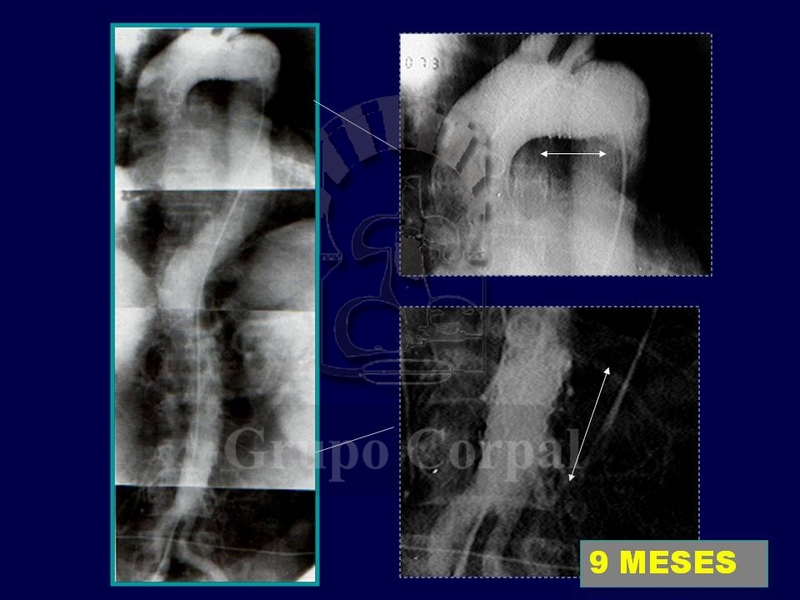 If it is small, a compressive bandage and bed rest is sufficient, with periodical check-ups. 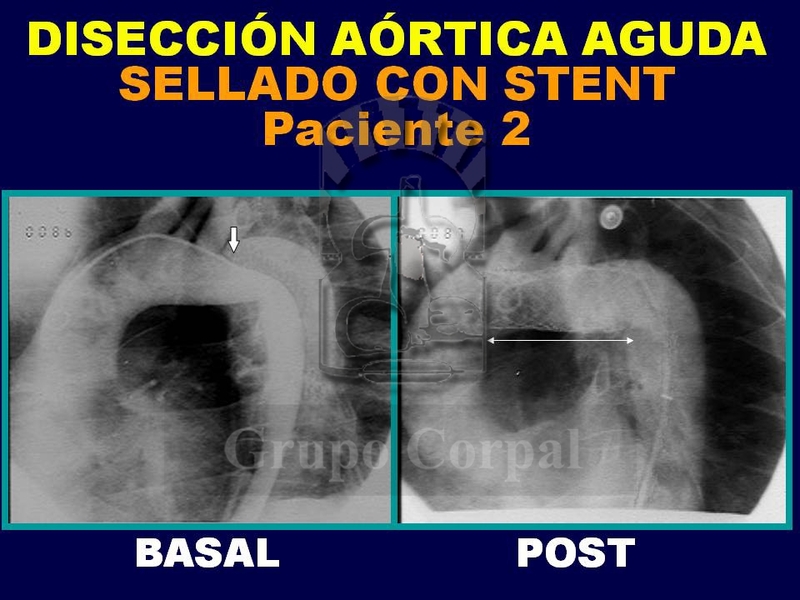 If it grows or the cavity is initially large, it has to be obliterated, closing the bleeding site. 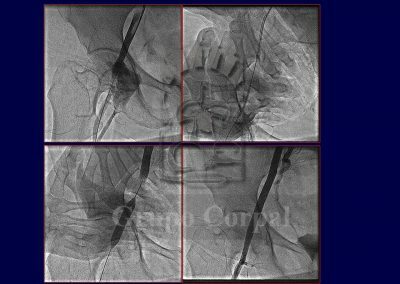 This can be done by injecting thrombin in the cavity if it is small, or by the implantation of coils (reference and figure). 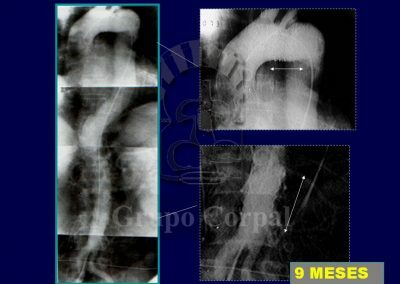 An effective, safe method that enables complete isolation of the cavity has been developed. The bleeding site is accessed internally, via a contralateral route, and drug-eluting stent of the same diameter as the femoral artery is implanted, thus isolating the pseudo-aneurysm. This is a safe, effective and definitive method. 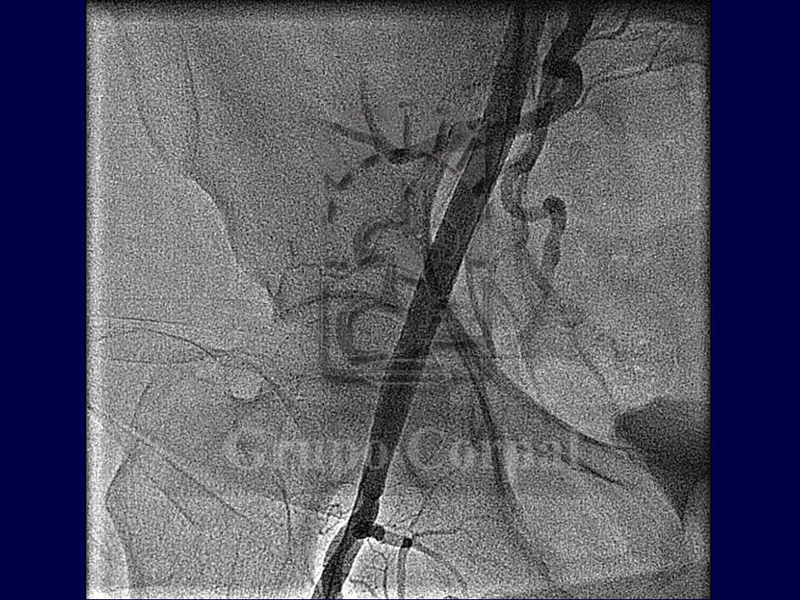 It can also be used to treat other types of complication, such as the post-catheterism onset of an arteriovenous fistula between the femoral artery and vein. 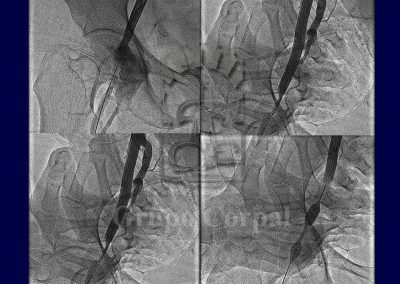 In this case, the groin is not swollen, as the bleeding drains directly into the vein. 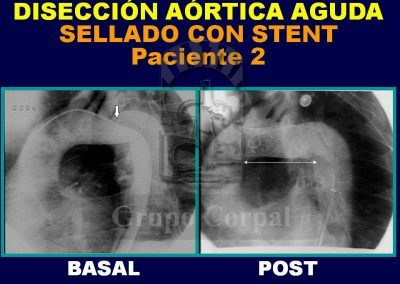 The implantation of a drug-eluting stent at the bleeding site closes the fistula completely and resolves the situation. 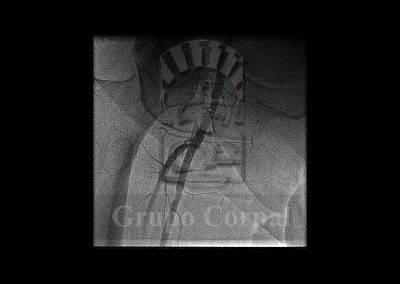 There have been numerous advances in the last few years in the percutaneous management of access route complications in femoral catheterisations. 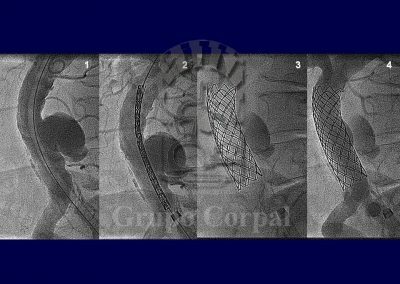 The approach to aortic aneurysms has always been surgical. 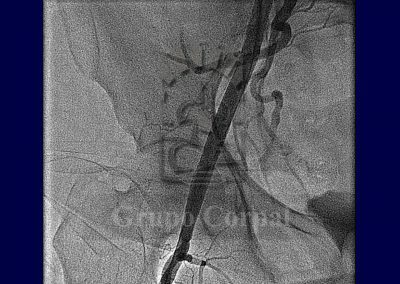 Nonetheless, percutaneous techniques can play a major role in aneurysms in which important vessels are not compromised, as they can be excluded from the circulation by the implantation of drug-eluting stents. 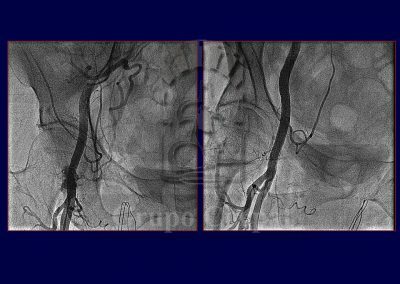 In both infra-renal and thoracic aorta locations, our group has closed atherosclerotic and even type B dissecting aneurysms (Figures). 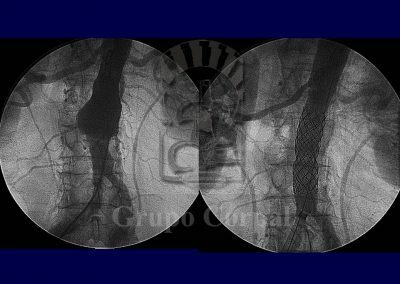 Anatomic knowledge is required for this indication, as a tailored stent is required. Post-intervention evolution is rapid and effective.